Located in the Indian Creek Recreation Area along Highway 211, on the way to the Needles District of Canyonlands National Park, is the famous Newspaper Rock petroglyphs site. Stretched out along Indian Creek for the next several miles past the Newspaper Rock site are four more petroglyph sites that are well worth investigating. We have numbered 3 of them as Sites #1,#2 and #3. 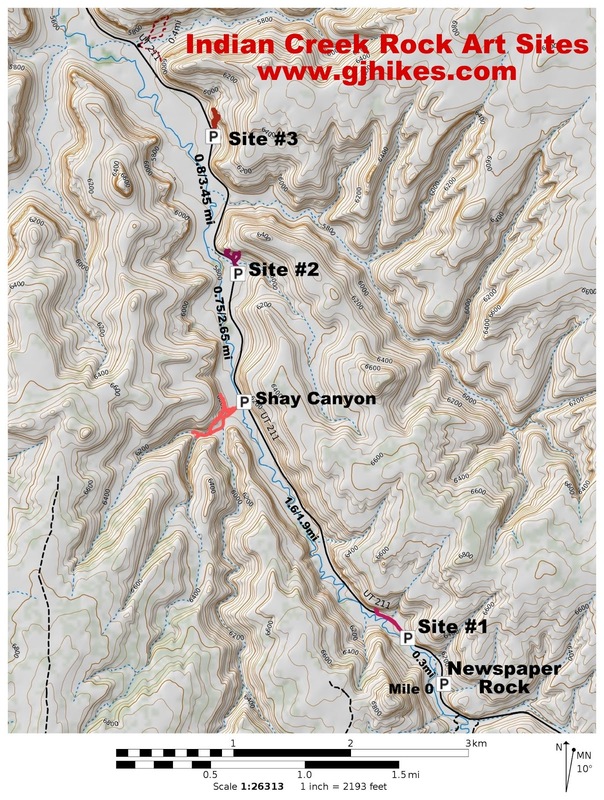 The fourth site is more commonly known as Shay Canyon. This post covers Site #2. 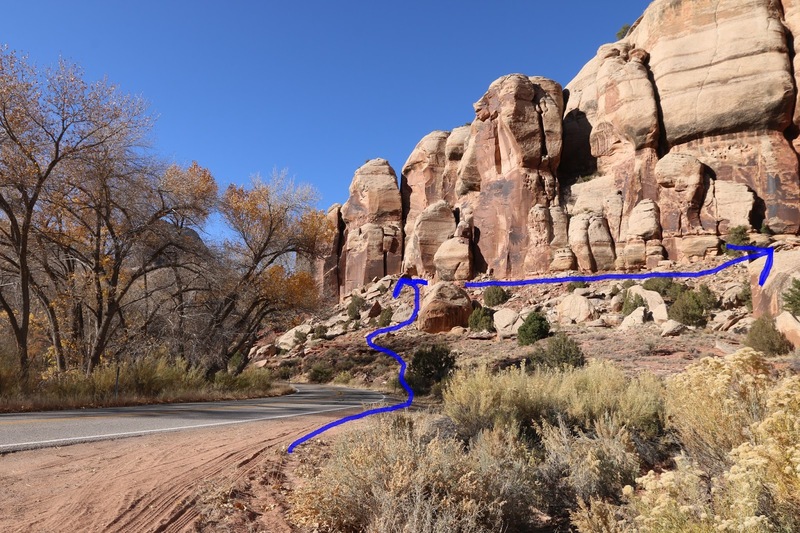 To get there either drive south for 40 miles from Moab or north for 14 miles from Monticello on US Highway 191 and turn west on US Highway 211. 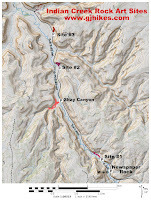 Continue along Highway 211 for 12 miles to the Newspaper Rock Site where there is a restroom. From Newspaper Rock keep driving toward the Needles District of Canyonland National Park until you reach mile marker 4. There is a large pullout on the east side of the road that serves as the trailhead for this post. The petroglyphs are a little further down the road near the point of the cliffs at the next turn. There are additional petroglyphs along the cliffs to the east of that point that are also worth investigating. From the parking area hike along the side of the road looking for a faint trail that leads up to the main panel of petroglyphs. The trail starts out nice and smooth but gets rocky as it turns along the base of the cliff. The most recent of the petroglyphs are very well preserved. They include an image with big feet that is rather common in southeastern Utah and reminiscent of a Hopi legend that we once read about of fierce warriors with big feet. There are two well preserved images wearing necklaces. The one on the right reminds me of one of the penguins in the movie 'Surfs Up'. If you look closely at the bighorn sheep to the left of its head they have their mouths open and appear to be growling or acting viciously. There is another panel of petroglyphs to the right that look much older and of a different style. Next to those are more images that are also unique looking. This panel has several snakes and a scorpion among other things. From the main group of panels you can work your way around the cliff into the side canyon where there are more petroglyphs and the only pictographs that we saw in the area. Some of the petroglyphs are located up high on the cliffs where they are harder to see and to photograph. Most of the vehicles that are driving by on the highway are headed to the Needles District unless they happen to be rock climbers. Indian Creek seems to attract several scores of climbers on a daily bases. They are instructed not to climb in spots where there are petroglyphs so you shouldn't run into any of them at this location unless they are also checking out the rock art. For those that enjoy hunting down rock art Site #2 along Indian Creek is well worth checking out. If you would like to see it for yourself then all you have to do is 'Take a hike'.